Speaking of owls, as I did on Thursday, here’s a portrait of one of the world’s largest owls, the Eurasian eagle-owl. Bigger than a snowy owl he is slightly outweighed by the endangered Blakiston’s fish-owl of Asia and has a slightly shorter wing span than the great gray owl. Despite these technicalities he is virtually the world’s largest owl. With females weighing up to 9.3 pounds they are bigger than our great horned owl (up to 5.7 pounds), the eastern screech-owl (weighing up to 1/2 pound), and the northern saw-whet owl (weighing only as much as 1/3 pound). The two smaller owls are dinner for the great horned owl. 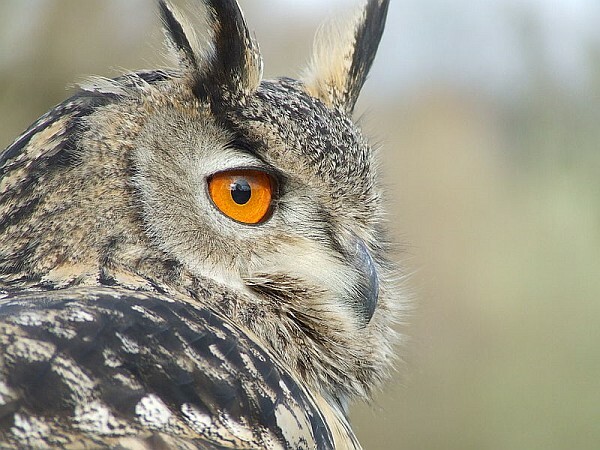 Imagine what a Eurasian eagle-owl eats! To get an idea of owl sizes, visit the National Aviary to see the eagle-owl and others up close. The Eurasian EagleOwl Must be an absolute nightmare to the lesser creatures in its range,esp. when one considers the mayhem conducted by the Great Horned Owl. Eurasian Eagle Owls are so beautiful! They’re eyes are gorgeous and it as if they peer right into you.